Note: Be sure to scroll down to the comments section where a reader has provided information on Carrie's parents, who appear to have been William and Emily (Merrill) Mulligan. Many thanks! 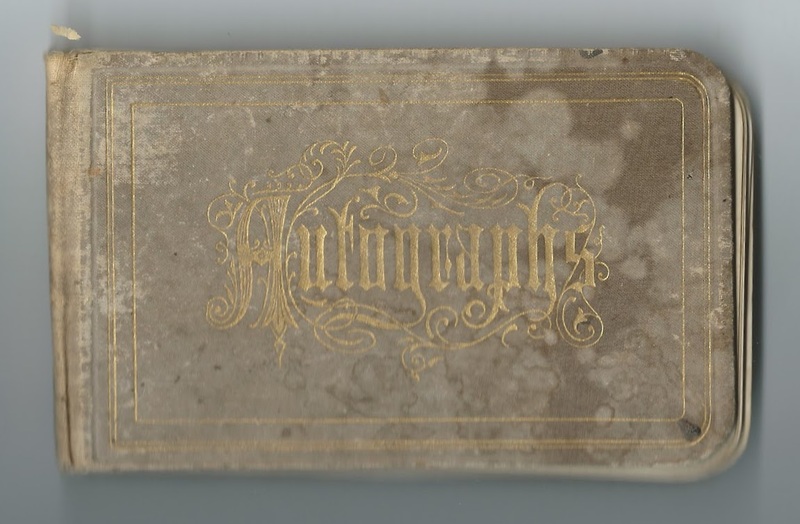 1878-1882 autograph album of Caroline D. Mulligan or Milligan, "Carrie", of Winona County, Minnesota, from before and after her marriage to James Granger. Most records show her maiden name as Mulligan, but I found at least one instance of Milligan. I was able to tease out Carrie's identity from signer Ella Nora Granger, who called Carrie her sister. Ella was the sister of Carrie's husband James Granger, whom Carrie married on November 21, 1880. 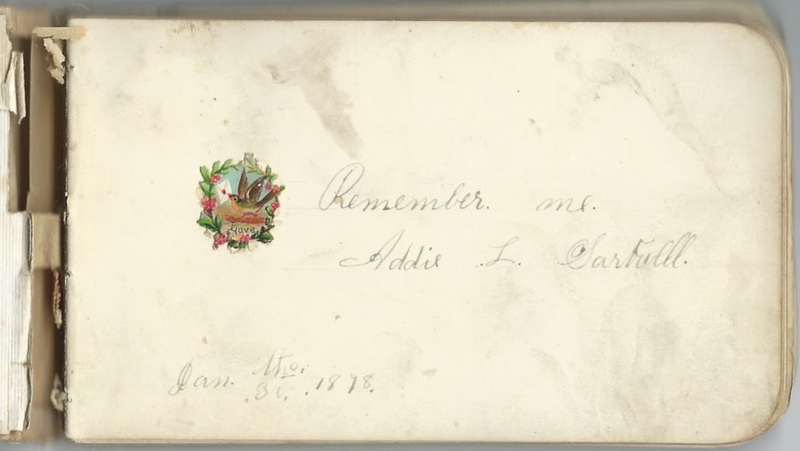 The album measures approximately 5-1/4" x 3" and contains the sentiments of 51 of Carrie's relatives and friends. An alphabetical surname list and an alphabetical list of the signers, together with any personal information they offered, appear at the end of this post. Caroline D. Mulligan/Milligan was born about 1862 in New Hampshire. Probably owing to the fact that I'm not positive of the spelling of Carrie's maiden name - perhaps it was even Milliken - I haven't found information on her father. Carrie's mother Emily, whose maiden name, I think, was Merrill, married Almon Sartwell, another New Hampshire native, on December 26, 1865, so apparently Carrie's father died when she was very young. Emily inscribed a page in her daughter's album. Carrie's younger half-sister Addie L. Sartwell, born September 25, 1868, signed the first page in the album, on January 30, 1878. She would marry Bert Thompson. 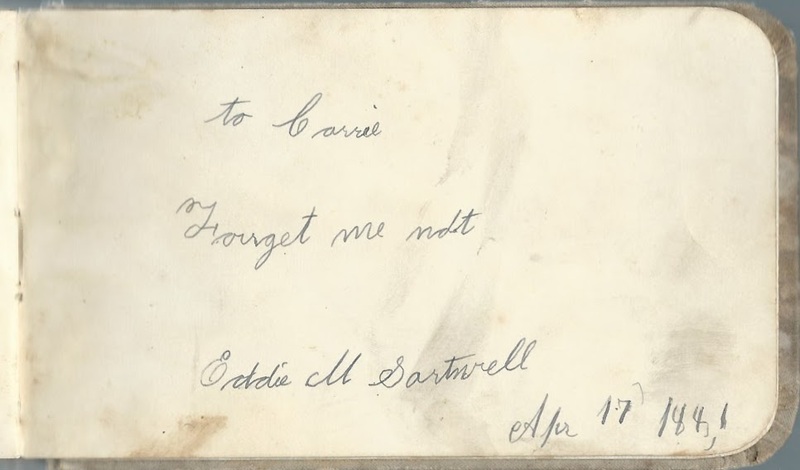 Carrie's younger half-brother Edgar M. Sartwell, "Eddie", inscribed the last page in the album, on April 17, 1881. He would marry May Gage. Before Almon Sartwell married Carrie's mother Emily, he had been married to Susannah (Beall) Sartwell, with whom he had several children, three of whom died young. Susannah died herself died only a month after the birth of daughter Susan Belle Sartwell, "Susie". 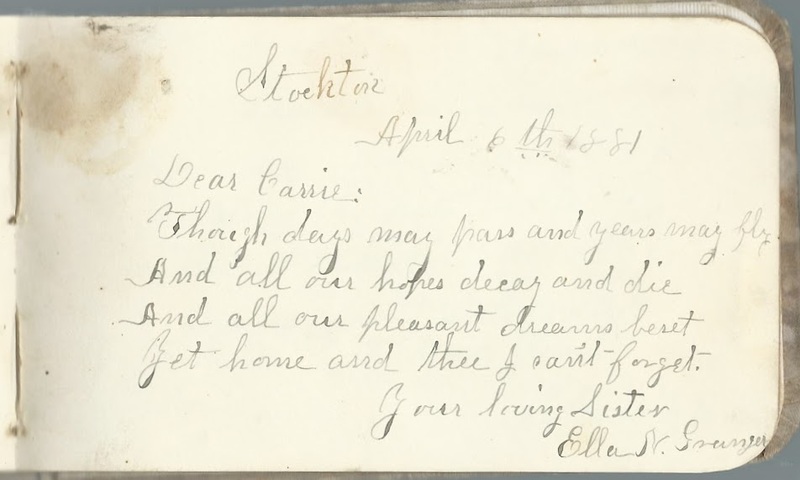 Susie, born October 25, 1863, inscribed a page in her stepsister Carrie's album, on January 30, 1878. Susie would marry Archie G. Southworth. On November 21, 1880 at Warren, Minnesota, Carrie married James Granger, son of William and Rebecca (Wood) Granger. James was born about 1856 in Wisconsin. 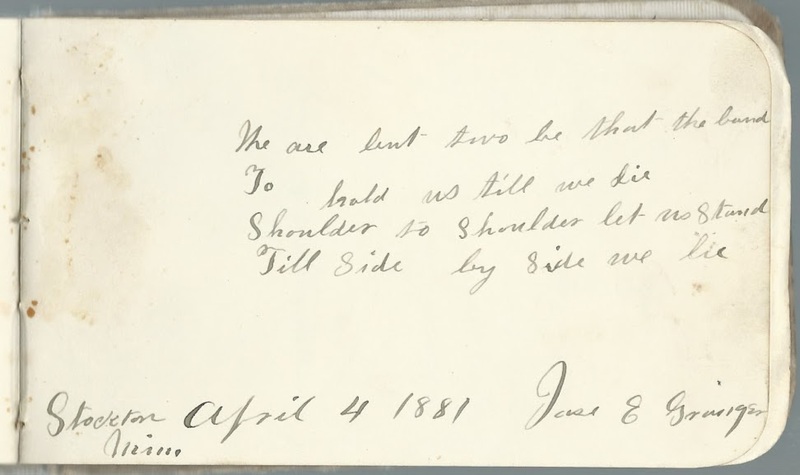 James inscribed a page in Carrie's album in April 1881. 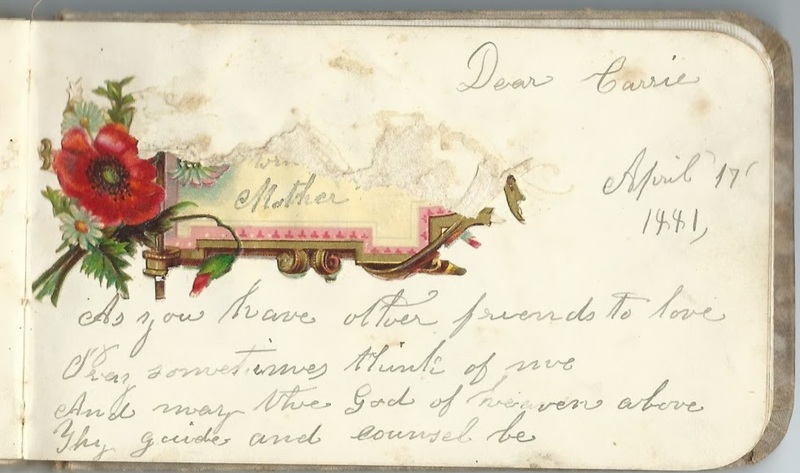 As noted at the beginning of this post, his sister Ella Nora also inscribed a page in April 1881. James and Carrie had a son Robert W. Granger, born about December 1882, and a daughter Gertrude E. Granger, born about September 1885. James Granger died September 27, 1888 at Winona, Minnesota. In the 1920 Census, Carrie, who had apparently not remarried after James' death, was living with her daughter Gertrude and husband Arthur Larson at St. Charles, Minnesota. 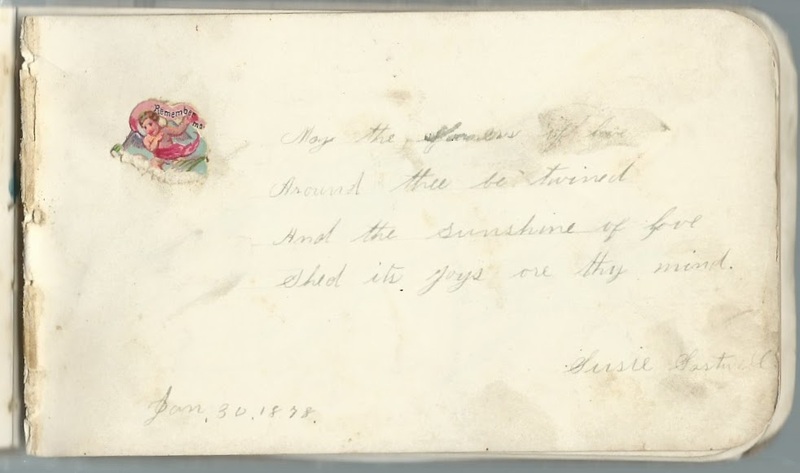 Esther Skidmore, signed on June 29, 187? Emily's maiden name is confirmed as Merrill in Edgar Sartwell's death record, 1944, Winona MN. She is the daughter of Leonard M Merrill and Susan C Ray, who were married 6 Mar 1828 in Warner, Merrimack, NH. and, aha, listed next to Leonard and Susan Merrill in 1860, in Groton, is William and Emily Mulligan. William is a farmer age 31, born in Lower Canada. No children. Emily and William were married 18 May 1854, in Groton, NH. He was of Manchester, she was of Groton. William Mulligan, of Groton NH, age 27, naturalized May 27, 1856, in Common Pleas Courth, Plymouth NH. Born in "Victoria". Arrived in US 1845. Witnesses: Joseph Kimball and Luther Elliott, both of Groton, NH. Wow - great information, Ed! Off to revise the post to direct readers to your comment.